If I was ever asked what was the best gift I had received when my kids were born, I'd say their blankets! Since birth my kids have taken their blankets (blankies as we call them) EVERYWHERE and I mean everywhere. The point of this post is to share a great store called BabyBlankets.com. They make unique and beautiful gifts for every occasion, every look and every child. All children need to have the comfort of their own blanket. I'm going on 29 and still take my blanket with me while traveling and have to have it every night. 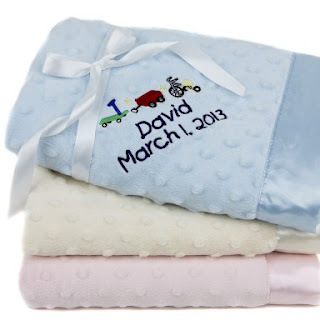 Click the link to view my choice of best baby blankets and I assure you will fall in love with something from the site. The unbelievably soft Dottie Snuggle Blanket is one of my favs for sure!